This issue’s cover celebrates salmon in the bay! Marlene Allen captured this angler’s joy with a great shot. It is very cool to have salmon and California halibut in the bay this year. I have never seen so many fishing kayaks covering the water. The evening tides have been beautiful and productive. CDFW biologist James Ray said the arrival of California halibut usually corresponds with warmer ocean conditions like the recent El Nino. They come to feed and are believed to come from San Francisco Bay where the northern-most breeding population resides. 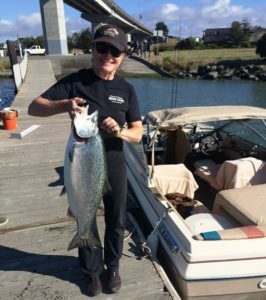 The down side of salmon hanging around the entrance to Humboldt Bay is the chances boating anglers take to catch them. Too many boats too close to the jetties. There were two accidents in August with one boat capsizing resulting in one fatality and three rescued and another boat washed up on the rocks without injury to the anglers. The boat was hauled onto the jetty by a loader. This comes after an incident free period when the entrance was especially dangerous because of the extreme shoaling. Details on how these accidents occurred are not available as of this writing but the same thing could have happened to Marlene and me. We trolled outside the bay one day without a strike so we made a pass near the North jetty on our way back in. We noticed a bunch of boats in the corner near where folks surf. I did not want to go in there and steered to round the jetty and enter the bay. The problem was other boats coming at me forced me too close to the end of the jetty. Although we passed between the boats and the jetty without trouble, a few minutes later in the channel, my engine died. The low trolling speed will sometimes load up the carburetor and it will flood. It takes a few minutes to restart. Had that happened while we were crossing near the jetty, we would have been washed upon the dolos. I knew better and it was a very rare instance that I was in that position, but again, it only takes once. Be aware and be careful. Clam Beach (also known as Little River Beach) Little River Beach in Humboldt County: Between Mad River and Strawberry Creek south of the boundary line due west from the Clam Beach south parking lot trailhead (40° 59.67’ N. lat.) open only during even-numbered years; between Strawberry Creek and Moonstone Beach and north of the boundary line due west from the Clam Beach south parking lot trailhead (40° 59.67’ N. lat.) open only during odd-numbered years. 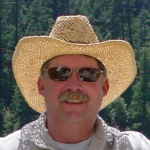 Public comment will be taken at the FGC meeting in Eureka October 19th. If approved, the change will likely take effect next year. HASA has funded a student to assist CDFW marine biologist Kathrine Crane with a surf perch otolith study. The student will age the otoliths collected from redtail perch taken in the Perchin’ on the Peninsula fishing tournament and other collection trips. The results will be similar to the Pacific halibut study showing age and weight/age ratios. Crane also tagged 11 redtail perch in the Samoa Marine Protected Area so if you catch a tagged perch be sure to contact Crane at CDFW. The Humboldt Area Saltwater Anglers (HASA) is floating an idea for the long-term solution to the sediment problem in Humboldt Bay. HASA is exploring the idea of using an artificial reef to trap or deflect the sediment as it moves north from the Eel River to Humboldt Bay. This is an option described in the document “Humboldt Bay Long Term Sediment Management Study” that was distributed during the April 2016 meeting at the Humboldt Bay Harbor District. 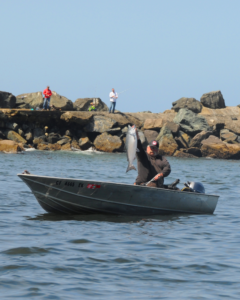 HASA has long pursued creating an artificial reef to enhance sport fishing opportunities out of Humboldt Bay. We dismissed the area south of the south jetty because of the sediment movement, fearing the artificial reef would be buried. The proposed sediment management study will evaluate littoral sediment transport and evaluate various sediment blockage, sediment removal, and a combination of sediment blockage and removal alternatives. Depending on the outcome of the study, an artificial reef could help solve the sediment shoaling issue and create rockfish habitat with the same project. During prior conversations with John Driscoll, who works for Representative Huffman and John Powell, Humboldt Bay bar pilot, we talked about sinking a ship or two to create a sediment barrier and still have enough structure exposed above the sediment to create fish habitat. After further review, the ships we were considering (decommissioned destroyers) are simply too big. The depths we are talking about range from 20’ deep behind the breakers to about 70’ deep, which should be well beyond the entrance to the Bay (we don’t think the sediment will move uphill). We need to maintain a 45’ clearance from the surface in navigable waters or get a waiver from the USCG. One potential option is to use smaller ships, such as derelict barges. These derelict barges are a big problem on the west coast because many of them are in danger of sinking (one recent article estimated there are 30 on the West Coast alone). There are no environmentally safe or economically viable ways to dispose of them at this time, and there is no agency willing to address the problem. The task would be to find a few barges that could be towed to Humboldt Bay and cleaned to EPA standards (no vessels that contained PCPs or other contaminants will be considered). There is space in Humboldt Bay to moor the barges while they are cleaned. Their size would fit nicely for our water depth and could act as a sediment barrier or deflector, and will create rockfish habitat that should last for many decades. We believe this would be much cheaper and more effective than placing rubble, quarry rock or concrete structures. It could be placed quickly and would last far longer than the other options identified. If we need the estimated 2000’ of reef to reach deep water, we could place a number of barges, bow to stern in a line and fill the gaps with rubble. If we place it within a mile of the south jetty we will not encroach on the commercial crab grounds. Of course, the Army Corp of Engineers study would have to evaluate where the artificial reef would be most effective to reduce shoaling, and address other details. The littoral sediment movement from the Eel River mouth to the jetties is called a Littoral Cell. Interrupting this flow of sediment with a structure can cause the loss of beach sand adjacent to the structure. The use of groins to reduce erosion along beaches and river banks has not been effective because the change in currents usually create a new problem downstream. Sand piles up on the upstream side and eddies erode the downstream side. In our case, the artificial reef could be strategically placed to target sand collecting in the entrance of Humboldt Bay. The likely erosion between the reef and the jetty should be considered in the study as we want to avoid excessive beach loss on the south side of the jetty. The challenge is to design the placement of the artificial reef to move sand offshore beyond the entrance of the bay, reduce shoaling at the harbor entrance, and avoid eroding the beach between the artificial reef and the jetty. This alternative could address a number of issues. It would address the environmental risk of the derelict barges sinking (along with the contaminants on-board), reduce or eliminate the shoaling problem at the harbor entrance, save millions of dollars in annual dredging, and create fish habitat that will enhance recreational fishing and tourism. Although HASA intends to continue work on our planned artificial reef north of the Humboldt Bay entrance, we would also wholly support this option for sediment management south of the entrance. We feel the community will embrace this solution and we are willing to work on public outreach to address any concerns. We are also willing to offer any assistance our organization can provide.